One of the largest privately owned sub-contract machinists in Europe providing complex, precision components across a wide range of industries including Automotive, Defence, Hydraulics, Gas, Medical, Electrical and Dental. 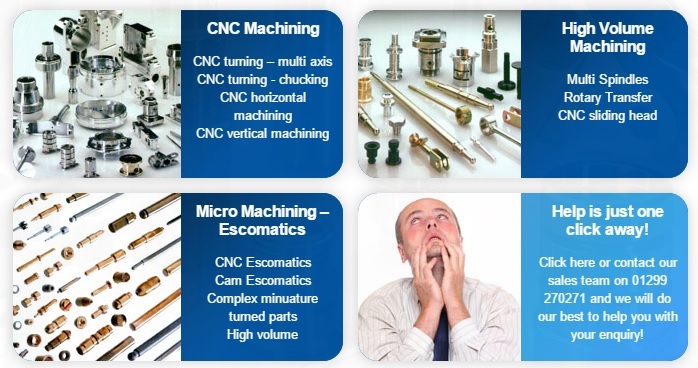 Specialising in High and Low Volume machining our capacity includes both Cam operated and CNC Escomatics, Multi-Spindles of all sizes and a wide range of CNC lathes and Machining Centres ensuring truly competitive prices are offered for a wide range of products. All manufactured by our highly skilled workforce to the ISO/TS16949 standard across five sites. The Muller ethos is to deliver machining solutions and services, whilst ensuring our employees maintain the highest ethical standards when doing business with our Customers and also within the community. It is essential that within the markets we operate that our values and professional attitude to all of our stakeholders are clear. Our experience and technical strength ensure a mature methodical approach to overcome obstacles and solve problems whenever they arise. We take pride in the extensive range of capabilities within the Group which operate at the cutting edge of technology within its specialised field. As a Group philosophy, we believe in long term relationships with our Customers, Suppliers and employees alike to help achieve sustainable growth, both locally and overseas, for everyone’s benefit. Operational excellence is the bedrock of our business. Investment in training and equipment provide the basis for continuous improvement throughout. We offer Quality, Service and Competitiveness – without compromise. 6 x 65mm bar dia. twin spindle twin turret CNC lathes with live tooling. 3 x 50mm bar dia. twin spindle twin turret CNC lathe with live tooling. 2 x 42mm bar dia. twin spindle twin turret CNC lathes with live tooling. 2 x 42mm bar dia. twin spindle single turret CNC lathes with live tooling. 3 x 300mm dia. turning dia. heavy duty CNC chucking lathes. 17 x 200mm dia. turning dia. CNC chucking lathes. 6 x 16-32mm bar dia. CNC sliding head lathes with live tooling. 4 x twin pallet horizontal CNC machining centres – table size 400mm x 400mm. 4 x high speed CNC vertical machining centres. 4 x heavy duty CNC vertical machining centres. 1 x high speed CNC drill machining centre.